If all blossoms on a fruiting plum tree set fruit and none of the plums dropped before ripening, most of the tree's branches would break under the load long before harvest. Many factors naturally thin the crop on all types of fruit trees. Trees compensate for frost damage, insect attack and drought stress by setting more fruit than the tree can bear and dropping the imperfect fruits or excess crop through the growing season. Owners of plum trees may need to intervene and thin fruit themselves during exceptionally good years. Late frosts may thin much of the fruit newly set on the plum tree. Frosts seldom destroy the entire crop but often reduce the yield below the maximum the trees could bear. Choosing frost-tolerant varieties helps, but locating the orchard on a slope rather than in a low-lying frost pocket provides some natural defense. Without pollination fruit will not develop on the plum tree. Tiny green plums form but soon shrivel and drop. Poor pollination could be weather-related, since plum blossoms depend on insects to carry pollen from tree to tree. Cold weather during the blooming period may limit the activity of bees and other insects. Before and during the blooming period, avoid using insecticides near fruit trees. The plum curculio attacks unripe fruits of many kinds, including the plum. Damaged fruit drops early and shows the typical dark pockmark where the female curculio drilled a hole and laid its eggs. Controls include regular spraying with general-purpose insecticide, but cleaning up fallen fruit also disrupts the insect's life cycle. Every few days, rake up dropped plums and either burn them or seal them in plastic bags for disposal. 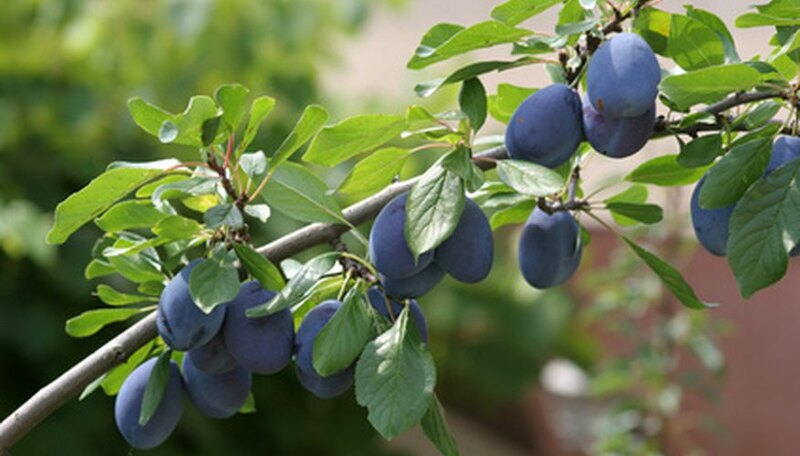 Several types of fungi may attack the fruit of the plum tree and either damage or ruin the plums, causing an early fruit drop. Regular applications of fungicide control brown rot and other common fungal diseases. Regular cleanup of fallen fruit and a thorough pruning of diseased branches during the winter also reduce the impact on the crop. The European viral disease called Sharka first entered the U.S. in the late 1990s and causes plums and other stone fruit to shrivel and fall. The only effective control of sharka or plum pox virus (PPV) involves quarantine of infected orchards and destruction of diseased trees. Plum trees drop fruit naturally in two major cycles. The first drop happens in spring when the tree sheds infertile plums over a two- or three-week period after blooming. The second drop happens in midsummer. Not all plum varieties exhibit this June drop, which most commonly affects the Italian prune plum. Where the drop is not sufficient, plum quality may be poor. Improve the fruit by thinning to one plum every 3 or 4 inches on the branch. Why Do Apple Trees Not Bear Fruit Every Year?